YOU ARE VIEWING OUR MEDIUM CASTLES, WE ALSO SUPPLY SMALL AND LARGE CASTLES. 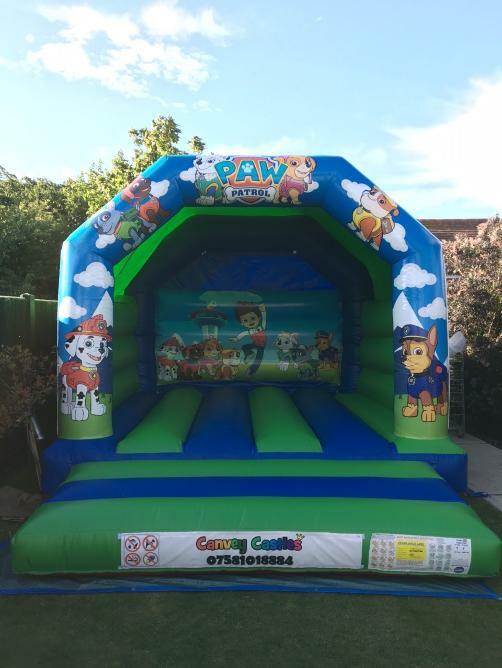 Deep sea blue and light light green paw patrol bouncy castle with all your fav characters on. Built in shower/ sun cover. WIDTH- 12ft. LENGTH- 15ft. HEIGHT- 10ft. Deep sea blue and purple bouncy castle with dolls artowork. Built in shower/ sun cover. 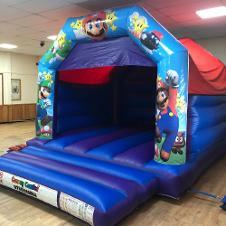 Red, blue, green and yellow disney character themed bouncy castle. Built in shower/ sun over. Deep sea blue and purple bouncy castle with unicorns and rainbows artowork printed on. Built in shower/ sun cover. Blue and Red Avengers themed bouncy castle with all childhood heroes and villans. Built in shower/ sun cover and sun visor on frontage. WIDTH- 12ft. LENGTH- 12ft. HEIGHT- 10ft. RED AND ORANGE PARTY BOUNCY CASTLE. Red and orange bouncy castle with balloons party time on top of arch. Built in shower/ sun cover and sun visor on frontage. THOMAS AND FRIENDS BOUNCY CASTLE. 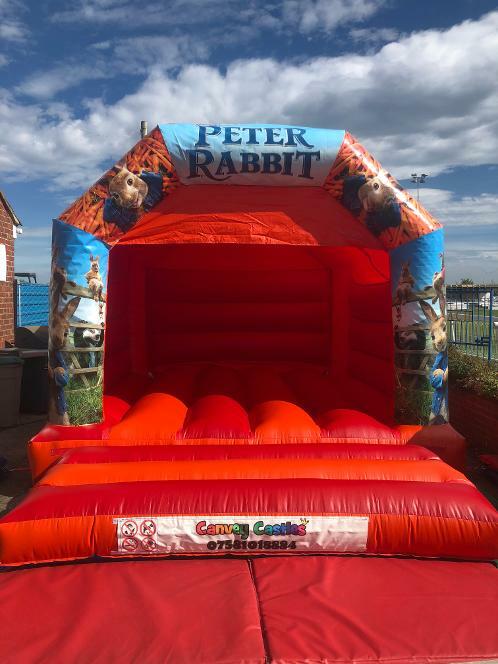 Red and blue thomas and friends themed bouncy castle with high quality pictures of thomas the tank engine. Built in shower/ sun cover. WIDTH- 11ft. LENGTH- 13ft. HEIGHT- 10ft 6"
red and blue circus clown themed bouncy castle with hand painted artwork of balloons and clowns. Freindly clowns which your children will love! Red and blue spongebob squarepants themed bouncy castle with high quality pictures of sponge himself. Built in shower/ sun cover. Red and blue peppa pig themed bouncy castle with high quality pictures of peppa, george, mum and dad. Built in shower/ sun cover. 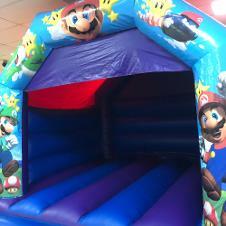 Red and blue fireman sam themed bouncy castle with high quality of sam himself! An all time childrens favourite programme. Built in shower/ sun cover. Yellow, blue and green party themed castle with balloons and confetti painted on great for boys and girls. Built in shower/ sun cover. 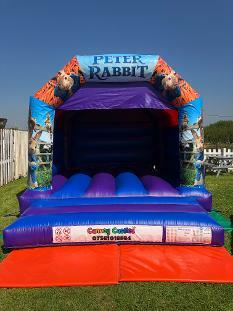 Red and purple fortnite themed bouncy castle with high quality pictures on all frontage of the castle. Built in rain shower/ sun shade cover also front visor. Red and orange dinosaur bouncy castle with dinosaur art all around front arch. Built in shower/ sun cover and sun visor on frontage. Black and Red Super Hero bouncy castle with all your favorite marvel characters printed on. Built in shower/ sun cover. Deep sea blue and purple bouncy castle with Ninja Turtles artowork. Built in shower/ sun cover. Deep sea blue and light babyblue disney frozen bouncy castle with frozen characters hand painted on. Built in shower/ sun cover. DISNEY PRINCESS DESIGN 2 BOUNCY CASTLE. 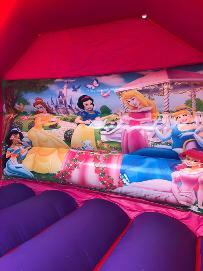 Pink and Purple themed bouncy castle with all famous princess characters. Built in shower/ sun cover and sun visor on frontage. 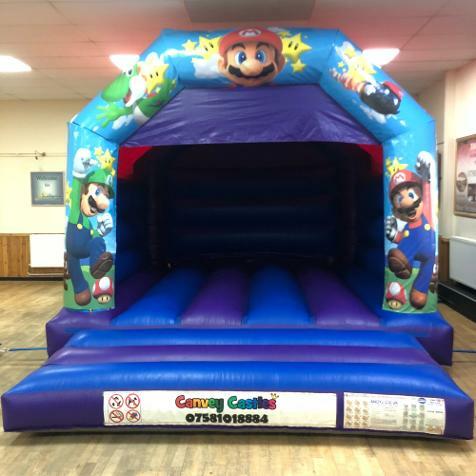 Blue and purple super mario themed bouncy castle with mario and luigi on top of arch. Built in shower/ sun cover and sun visor on frontage. A spectacular Deep sea blue and purple bouncy castle with trolls themed artowork printed on . Built in shower/ sun cover. PURPLE AND BLUE PARTY BOUNCY CASTLE. Deep sea blue and purple bouncy castle with balloons party time on top of arch. Built in shower/ sun cover and sun visor on frontage. CLOUD 9 SMILEY BOUNCY CASTLE. 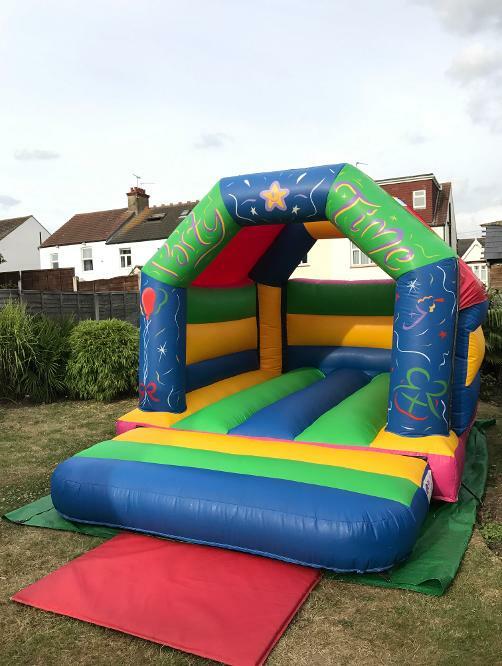 Yellow, pink, red and blue multi coloured cloud smiley face themed bouncy castle with blue stars along the top of frame. Built in shower/ sun cover. red and blue minions themed bouncy castle with high quality pictures of the little yellow things . Built in shower/ sun cover. 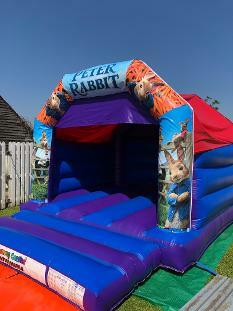 Purple, yellow, red and green multi coloured themed bouncy castle. This is one of our plain castles suitable for many themed partys. Built in shower/ sun cover. WIDTH- 12ft. LENGTH- 15ft. HEIGHT- 9ft 6"
Red and blue jurassic world themed bouncy castle with high quality pictures of dinosaurs. Built in shower/ sun cover. Red and yellow party balloon themed castle with balloons, stars and confetti printed onto pillars and rear wall. Red and blue moana themed bouncy castle with high quality pictures of the childrens favourite disney movie. Built in shower/ sun cover. 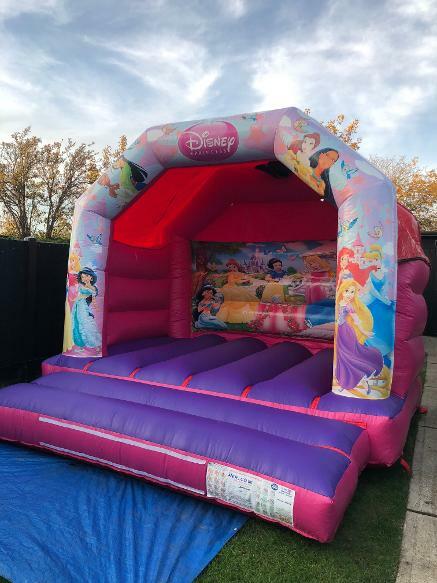 Red and orange bouncy castle with disney princess themed. Built in shower/ sun cover and sun visor on frontage.